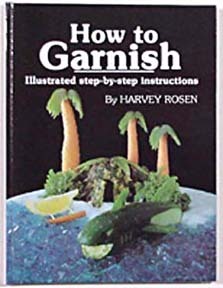 Garnish is a $23 million enterprise in the U.S.: $23 million of wasted food.Garnish is a waste of farmer's time, is a waste of gas to transport hundreds of tons of garnish each year, and is a waste of landfill space. We must stop this waste. 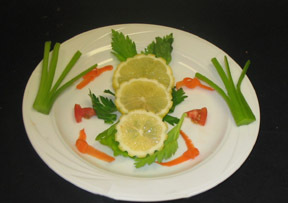 A letter writing campaign to restaurants urging them to desist in using garnishes. A letter writing campaign to culinary schools, to stop the garnish indoctination of new chefs. All Garnish: no actual food. Here is a tool used to brainwash our young chefs. Note the shark cucumber, garnish designed to indoctinate children. Join the GOOP discussion list at Google Groups for news, updates and our victories. We will be strong. We will be free. We will be garnish free.